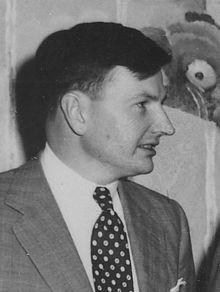 Pocantico Hills, New York, A.S.
David Rockefeller (12 Jun 1915 – 20 Mac 2017) merupakan seorang ahli bank Amerika yang memegang jawatan sebagai pengerusi dan ketua eksekutif Chase Manhattan Corporation. Beliau merupakan salah seorang ahli keluarga Rockefeller yang paling lama hidup dan partriak keluarga dari Mac 2004 sehingga kematiannya pada Mac 2017. Rockefeller merupakan anak kepada John D. Rockefeller Jr. dan Abby Aldrich Rockefeller, dan cucu John D. Rockefeller dan Laura Spelman Rockefeller. Beliau terkenal kerana hubungan politiknya yang luas dan perjalanan asing, di mana beliai bertemu dengan banyak pemimpin asing. Kekayannya dianggarkan pada $ 3.3 bilion semasa kematiannya pada Mac 2017. Rockefeller meninggal dunia sewaktu tidur pada 20 Mac 2017 pada usia 101 di kediamannya di Pocantico Hills, New York. ^ a b "David Rockefeller, Sr". Forbes. Dicapai March 20, 2017. ^ "James S. Rockefeller, 102, Dies; Was a Banker and a '24 Olympian". The New York Times. August 11, 2004. Dicapai 2012-09-16. James Stillman Rockefeller, who helped capture an Olympic rowing title for the United States before a banking career with a company that eventually become Citigroup, died yesterday at his home in Greenwich, Conn., his family announced. He was 102. ^ Smith, Timothy R. (March 20, 2017). "David Rockefeller Sr., steward of family fortune and Chase Manhattan Bank, dies at 101". The Washington Post. Dicapai March 20, 2017. ^ Kandell, Jonathan (2017-03-20). "David Rockefeller, Philanthropist and Head of Chase Manhattan, Dies at 101". The New York Times (dalam bahasa Inggeris). ISSN 0362-4331. Dicapai 2017-11-06. The Rockefeller File, Gary Allen, ´76 Press, Seal Beach California, 1976. The Rockefeller Century: Three Generations of America's Greatest Family, John Ensor Harr and Peter J. Johnson. New York: Charles Scribner's Sons, 1988. The Rockefeller Conscience: An American Family in Public and in Private, John Ensor Harr and Peter J. Johnson, New York: Charles Scribner's Sons, 1992. The Life of Nelson A. Rockefeller: Worlds to Conquer 1908–1958, Cary Reich, New York: Doubleday, 1996. Abby Aldrich Rockefeller: The Woman in the Family, Bernice Kert, New York: Random House, 1993. Those Rockefeller Brothers: An Informal Biography of Five Extraordinary Young Men, Joe Alex Morris, New York: Harper & Brothers, 1953. The Rockefellers: An American Dynasty, Peter Collier and David Horowitz, New York: Holt, Rinehart & Winston, 1976. The American Establishment, Leonard Silk and Mark Silk, New York: Basic Books, Inc., 1980. American Hegemony and the Trilateral Commission, Stephen Gill, Boston: Cambridge University Press, Reprint Edition, 1991. The Chase: The Chase Manhattan Bank, N.A., 1945–1985, John Donald Wilson, Boston: Harvard Business School Press, 1986. Wriston: Walter Wriston, Citibank, and the Rise and Fall of American Financial Supremacy, Phillip L. Zweig, New York: Crown Publishers, 1995. Paul Volcker: The Making of a Financial Legend, Joseph B. Treaster, New York: Wiley, 2004. Financier: The Biography of André Meyer; A Story of Money, Power, and the Reshaping of American Business, Cary Reich, New York: William Morrow and Company, Inc., 1983. Continuing the Inquiry: The Council on Foreign Relations from 1921 to 1996, Peter Grose, New York: Council on Foreign Relations: 1996. Imperial Brain Trust: The Council on Foreign Relations and United States Foreign Policy, Laurence H. Shoup, and William Minter, New York: Authors Choice Press, (Reprint), 2004. Cloak of Green: The Links between Key Environmental Groups, Government and Big Business, Elaine Dewar, New York: Lorimer, 1995. The Shah's Last Ride, William Shawcross, New York: Simon & Schuster, 1989. Divided We Stand: A Biography of New York City's World Trade Center, Eric Darton, New York: Basic Books, 1999. The Power Broker: Robert Moses and the Fall of New York, Robert Caro, New York: Random House, 1975. The Rich and the Super-Rich: A Study in the Power of Money Today, Ferdinand Lundberg, New York: Lyle Stuart; Reprint Edition, 1988. Interlock: The untold story of American banks, oil interests, the Shah's money, debts, and the astounding connections between them, Mark Hulbert, New York: Richardson & Snyder; 1st edition, 1982. The Money Lenders: Bankers and a World in Turmoil, Anthony Sampson, New York: Viking Press, 1982. The Chairman: John J. McCloy – The Making of the American Establishment, Kai Bird, New York: Simon & Schuster, 1992. Laman ini diubah buat kali terakhir pada 12:02, 19 September 2018.